How do you study the social habits of an animal that's shy, comes out only at night to scurry through tree branches in dense jungles, and is the size of an M&M packet? You could try talking to its body lice. 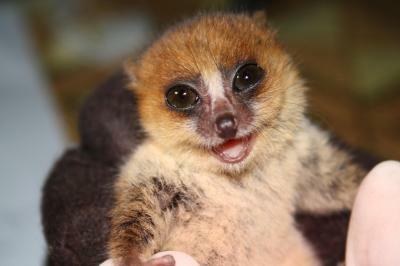 The brown mouse lemur (Microcebus rufus) is an almost supernaturally adorable primate that lives in Madagascar. Thanks to its tininess and hard-to-access habitat, scientists don't know much about its behavior. So to get the scoop on the lemur's social life, a group of researchers turned to the lemur's less adorable companion: the louse Lemurpediculus verruculosus. This louse is much like the ones you're familiar with. It clings to a host's hairs while sucking its blood, and is happy to switch hosts if another animal comes in close physical contact. The brown mouse lemur's louse lives mainly on the primate's ears, where fur is sparser and skin is easy to reach. It also hangs out on lemurs' eyelids and testes. Led by Sarah Zohdy from the University of Finland, researchers trekked into the jungle and placed traps for mouse lemurs, baiting them with fresh banana. During their study period, they managed to catch 32 of the elusive primates. On each lemur, the researchers did a thorough lice check with a comb, like a kindergarten teacher would. (They note that it's easy to spot the lice since their size is so great compared to the size of the lemur.) Then, without removing any lice, they marked the bugs on each lemur's ears with a lemur-specific code--a set of colored nail-polish dots applied to every louse's back with a toothpick--and after a few seconds for drying, set the lemurs free again. Whenever the team recaptured a lemur they'd already seen, they checked the animal's lice to see whether it was still carrying only its own bugs, or had shared with a friend. Their observations coincided with the lemurs' brief breeding season, during which they expected to see a sharp increase in sharing. Sure enough, almost all the louse swaps that Zohdy and her team observed happened during the breeding season. They also happened exclusively between males, who were the main carriers of lice. Among the 9 female lemurs they captured, the researchers found just 1 with lice. But 14 out of 23 males were infested at some point during the experiment. Though male lemurs are known to share nests, Zohdy speculates that the spike in louse sharing during breeding season comes from males grappling with each other to compete for females. It's possible that some lice were transferred during mating, spending time on female lemurs in between male hosts. But for the most part, the lice seem to prefer male company. The lice seemed to say, then, that male mouse lemurs have the closest contact with each other when they're fighting over females during mating season. 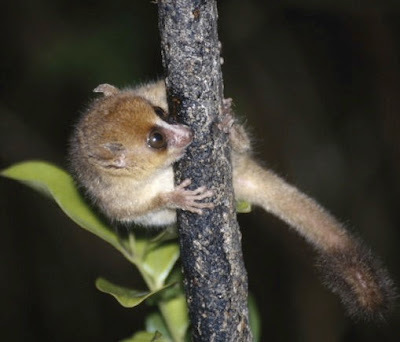 They also revealed that brown mouse lemurs range farther than previously thought. Based on previous trapping studies, the researchers expected that lemurs would stay within a small range, and that louse sharing would decrease as they got farther from their home base. But lemurs surprised researchers by spreading their lice far afield. So brown mouse lemurs aren't homebodies, after all. And though they're shy, they may bump elbows with plenty of their peers during mating season. This information isn't just useful for understanding the lives of lemurs: Since lice and other parasites can carry diseases, knowing how they travel can help scientists predict the spread of infections. The technique of using parasites as surveillance bugs could help scientists spy on other hard-to-find animals and learn more about their lives--sordid details included. Images: Iraiidh/Wikimedia Commons; Sarah Zohdy. I decline to speculate as to how the lice got from the ears to the testes.